In recent times there has been a wonderful crop of oversized books available for children, and this is one of the most over-the-top beautiful examples. 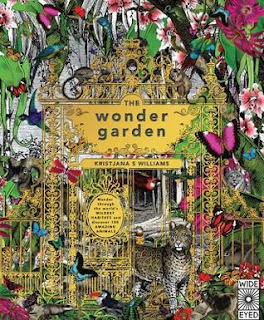 Blessed with what I think must be newly available in the book-printing world - fluorescent colour, the cover topped off with an ornate gold foil fence, like a magnificent Victorian zoological garden. There are so many layers of flash that you need to calm down a bit and look closely to see what you are holding in your hands. The sub-title says: Wander through 5 habitats to discover 80 amazing animals. I like that the habitats are not generic - a desert, a rainforest, mountains etc, but specific places - the Chihuahuan Desert, the Amazon Rainforest, the Himalayan Mountains, the Black Forest and the Great Barrier Reef. Each habitat has a lush double page heading with innumerable creatures and plants illustrated in vivid colour followed by a page of general description faced by several of the creatures found there, which have numbers and a key to identify them, but no other information. The two spreads after this have a handful of interesting animals, insects etc with their Latin name and some specific information about them. There is a problem here though - there are many creatures on these pages, but only a few are written about and it's not always obvious which creature the text is about. It must have been an unbelievably hard task to choose the few to write about, from the multitudes there. I expect there will be many parents having to put in some extra research with their child who wants to know what each thing on the page is called. The colour is quite extraordinary, almost an assault on the senses as you turn the pages. The fluoro pink background for the Chihuahuan Desert information page almost seems to give off the heat of the desert itself. The drawings of the animals and plants have been done in a style reminiscent of engravings, with the colouring veering between natural browns and greens and the vivid orange, red and pink. Scale is not to be relied upon, the tiny drawn large, the enormous reduced to suit the layout. Take the High and Mighty - the birds of the Black Forest, where kingfishers balance on enormous acorns. I've never been diving in a coral reef, but I'm doubtful that if I found a common octopus there it would be fluorescent orange with dazzling blue suckers. Rather than a giant fact book, this is more of a glorious fantasy anchored in the real world but requiring some more serious and accurate reference books, or the internet on the side to get to the truth of the matter. A coffee table book for kids. The illustrator, Kristjana s Williams is originally from iceland, but trained as a designer and illustrator in the UK, where she has won numerous awards. Have a look at her website and see some of the extraordinary things that have been made from her art. Whilst her art looks like it is made with intricate engraving prints she creates them digitally. An amazing talent. The text is by Jenny Broom who was also responsible for one of the other 'big books' out in recent times - Animalium. 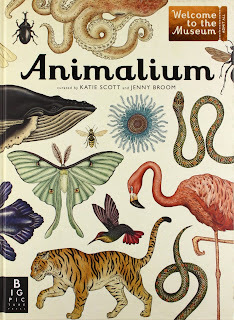 I couldn't find a book trailer for The Wonder Garden, but there is a great one for Animalium.